We've been getting reports of shots fired and a person hit at 909 West Wilson (EZRA). This took place around 6:15pm. First responders are on the scene and Wilson has been blocked off to traffic. More details as they come in. Update: The victim was shot under the arm and is on the way to Illinois Masonic, the closest trauma center. The shooter is described as a black male wearing a red hoodie. 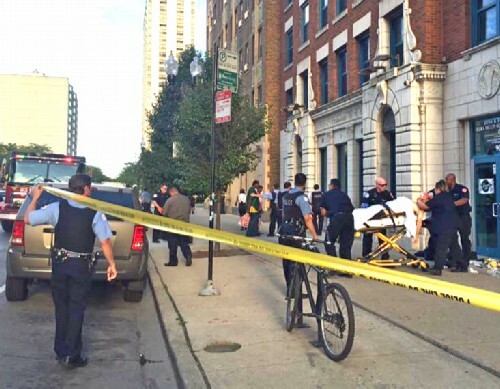 Update: The victim is in critical condition, according to a tweet from Ald. Cappleman. "Male shot early this evening and in critical condition. Police in area just before shooting. Ongoing investigation." Update: According to media reports, the man who was shot is 55 years old. Update: The shooting victim has died, the police confirm. He was shot at 921 West Wilson and made it to 909 West Wilson, where he collapsed. Many are saying he was not the intended victim. Tragic. Our thoughts are with his loved ones. UU Note: Gangs in Uptown are notoriously quick to retaliate after a shooting. If you see anything that looks like it's about to be trouble, call 9-1-1. There will be extra police out due to the violence. Call 9-1-1 if you see gang loitering or anything that looks like it has the potential to develop into a violent situation. There must be surveillance cameras of this shooting. It's coming to fruition that MOST of these shootings and murders are done by "early parolees" and those on electronic device monitor....maybe we should be pointing fingers at Periwinkle and Dart for their County policies. I was looking out my high rise building apt at same time 4 shots were fired slowly but possibly 5-6. It was an echo so shooter must of been in alleyway or parking garage. Many people in apts seen it happen live and cowered down while others just watched. The black man in Red Hoodie is always waking around area. He is no older then 20ish and has short dark hair. Police took too long to get there because no one called them earlier. All the teens etc and observers know who it is but afraid to come forward. This will never stop and Mayor has no balls. I am moving along with many other people. My name is Donny, my fiancé, was once married to the victim. We are the ones who received the call from CPD, informing us of his murder. We ask that anybody that sees this "black man in red hoodie," who apparently, "is always walking around area," to immediately call the authorities! Nobody is going to know who "dimed" him out! This punk needs to be brought to justice, and must pay for what he has done! The longer he, and his other gangbanger, dirtbag friends remain at large, who knows how many more innocent, peaceful citizens, will be gunned down? The Mayor, never had any balls! Those of us who do, would, and should, help put a stop to this crap NOW! Please help Chicago stop the cycle of murders! It's never too late!!! If you have any information that could ID the shooter(s) you should absolutely be calling the police instead of posting a comment here. Uptown gangs are so fast to retaliate because there is 3 or 4 of them in a small area. They love Uptown because of the clients that buy drugs from them. I rarely even see a squad car with their windows rolled down anymore. Correct. And their buyers seem to be the transients who "live" in the numerous SROs/flophouses of the area...Ever observe the activities around the Darlington, the Hazelton, Malden Arms Apts, etc? We need to stop with the race card b.s. and the poverty-pushing for many of the Uptown hobos who don't seem to have any mental illness. Those people end up in that lifestyle for a reason. Close the SROs, enforce stop-and-frisk for anybody loitering or engaging in suspicious activity, and send the homeless and addicts to institutions. Our taxes are paying for their sh*t one way or another. We'd might as well get them away from the upstanding citizens, at least. Call me crazy, but in the past two months I've noticed a big spike in people wearing red in the area. Is it really a coincidence that 3-4 guys are wearing red shirts/hoodies and standing around together? Has there been a shift in the gang territory? Even the usual adults around the parks are suddenly and conspicuously wearing bright red. Am I crazy?